For the fifth year in a row and 6 of the past 7 years, LISOT is proud to have a sailor qualify for the USA World Team! 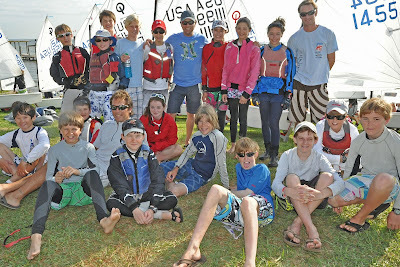 And for the fifth year in a row, LISOT is home to the top female Opti sailor in the United States. Congratulations to Harry Koeppel (Larchmont YC) and Megan Grapengeter-Rudnick (Noroton YC) for carrying on the LISOT tradition! After 13 windy and grueling races over 4 days of US Team Trials at Texas Corinthian YC in Houston, Harry finished 5th and qualified for the 5-sailor USA World Team, a mere 2 points out of 3rd place in the 185-boat fleet. Megan lead among the girls, taking the top female spot by 11 points ahead of the next girl competitor. That makes a “hat trick” for Megan as the top female opti sailor in the US, UK and Argentina, as well as #2 in South America. Congratulation to the two-thirds of the 18 Team LISOT sailors at Team Trials who qualified for international teams, and almost all, except the 4 who are aging out (Harry, Liza, Megan and Reinier), who qualified for the new, smaller and more competitive 60-sailor US National Team. Team Trials finished up on choppy Galveston Bay with a windy 13th race on Sunday morning under crystal blue skies and a 12-15 knot Northwesterly that built to 20 knots before the final race of the regatta was over. This was the most number of races in a team trails in recent memory, as well as the most number of consistently windy and physically demanding races. PRO Ron Hopkins, USODA President and class rep Robin Kuebel, and the TCYC Race Committee did an outstanding job of running very fair and competitive racing. In fact, Ron abandoned Race 12 when flight one was half way up the first beat because a 30 degree right shift came blasting across the race course. The race, and subsequent starts in that flight, went off smoothly and in a more consistent, 20 knot southerly that settled across the course. LISOT’s talented and extremely experienced coaching team of Head Coach Pepe Bettini, Pablo “Panic” Panichelli and Fernando Gwozdz were terrific with the sailors both individually and in building a true team. And congratulations to the other 4 members of the USA World team: Wade Waddell (Ft. Lauderdale YC), Christopher and Duncan Williford (Ft. Lauderdale YC) who have been coached frequently in their opti career by current LISOT head coach Pepe, and Richard Schuurmans (Houston YC). And good luck to Chris, Duncan and Wade, representing the USA, as they head off to Venice for the Marco Rizzotti Team Race later this month. Thanks to our friends at TCYC, Houston YC and Lakewood YC who ran a terrific event, with wonderful Texas hospitality and incredible Texas sea breeze.